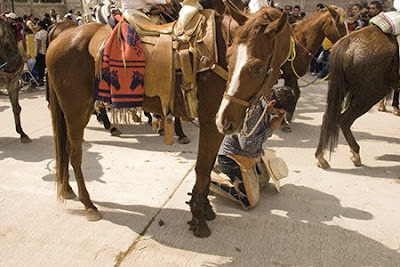 More than ten thousand faithful and curious attended the two day Blessing of the Horses in the village of San Martin thirty minutes south of San Miguel de Allende. A temporary city blossomed as hundreds of horses and riders rode across the Campo for a pilgrimage and celebration of all things equine. Dozens of food stalls purveying the likes of carnitas, barbacoa and tortas lined the pathways leading to San Martin's splendid square where riders, hat in hand, bowed before young Padres sprinkling holy water on them and their steeds. 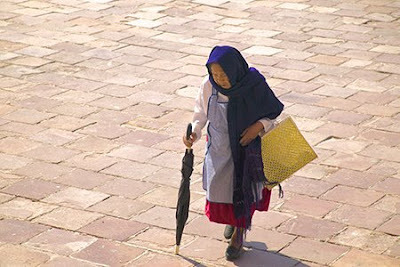 The shawl and checkered apron are traditional attire for older Mexican ladies from the Campo. This Dolores Hidalgo grandmother is crossing the square to church; a visit she makes every single day.